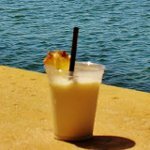 July 10 is National Piña Colada Day in Puerto Rico and the United States. This sweet fruity cocktail is a perfect drink for a hot summer day. By the way, did you know that piña colada is the national drink of Puerto Rico? Piña colada was invented in the early 1950s or early 1960s in Puerto Rico. The ownership of this drink is contested by thee bartenders. Piña colada became widely known in 1979 due to Rupert Homls' song “Escape”, also known as “The Piña Colada Song”. The cocktail's name is literally translated as “strained pineapple”. It is a reference to one of the drink's ingredients, freshly pressed and strained pineapple juice. Other ingredients are white rum and cream of coconut. Piña colada is usually served either shaken or blended with ice. It is typically garnished with a pineapple slice or maraschino cherry. There are different piña colada variations as well as piña colada-inspired cocktails such as amaretto colada (rum replaced with amaretto), chi chi (rum replaced with vodka), Staten Island Ferry (rum and cream of coconut replaced with Malibu Rum). The term “piña colada” sometimes refers to the coconut and pineapple combo used in a variety of desserts. Looking for recipes, you may come across piña colada cupcakes, piña colada bars, piña colada parfait etc.